Unlike some other groups of Christians in the U.S., evangelical Protestants have not declined much as a share of the U.S. population in recent years, according to a major new Pew Research Center study. Our 2014 Religious Landscape Study finds that since 2007, when a similar survey was conducted, the share of evangelical Protestants has fallen only modestly, from 26.3% of the adult population to 25.4%. By contrast, both Roman Catholics and mainline Protestants have declined by more than three percentage points during the same period. Looking at the raw numbers, the evangelical population actually appears to have grown slightly over the last seven years, rising from roughly 60 million to about 62 million. Again, this contrasts with mainline Protestants and Catholics, who together have lost several million adherents during the same time period. 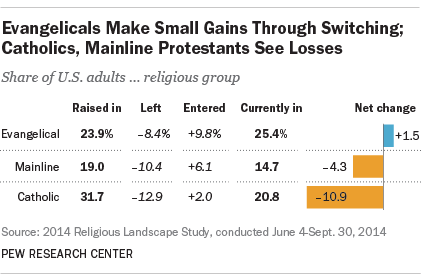 One big reason evangelical Protestants have not declined at the same rate as other major Christian groups is that they are gaining new converts at a greater rate than they are losing people who were raised in the tradition. While 8.4% of Americans were raised as evangelicals and have since left evangelicalism for another faith (or no faith), even more U.S. adults (9.8%) were raised in another faith (or without a religious affiliation) and have since become evangelicals. The same cannot be said for Catholics and mainline Protestants. For instance, a significant share of all American adults – 12.9% – are former Catholics, while only 2% have converted to Catholicism after being raised outside the Catholic Church. And 10.4% of the nation’s population is made up of former mainline Protestants, while only 6.1% have joined mainline churches after being raised in another tradition. Like the country as a whole, evangelicals also are becoming more ethnically and racially diverse, with non-white people making up roughly a quarter (24%) of the group – up from 19% in 2007. By contrast, there is less diversity in the mainline Protestant churches (14% non-white), but much more in the Catholic Church (41% non-white, including a large share of Hispanics). To look at it another way, white evangelical Protestants now make up nearly one-in-five (19%) of the nation’s adult population, while evangelical members of other racial and ethnic groups make up roughly another 6% of U.S. adults. 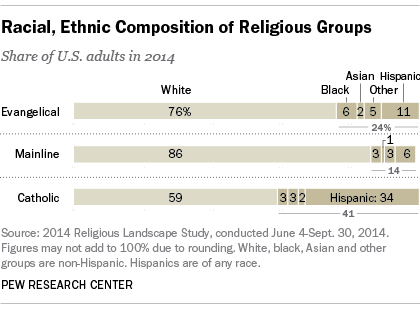 Hispanics are the largest group among non-white evangelicals.